The real value of Flickr in terms of small business marketing is the ability to create a personal brand and build a following around common interests. This post offers 10 tips for developing your personal brand on Flickr. They are offered in line with the small bsuiness marketing ideas discussed in the previous post. Your photos are your marketing medium but your profile is your marketing message. Take time and care in creating your profile and keep refining it to keep it up-to-date with your online marketing strategy. Focus is important here as is clarity. Take advantage of Flickr’s format offer in the profile area and add bold and italics and URL’s where appropriate … and images. Flickr adds “no follow” code to all links, so your focus should be on the reader, not search engine optimization (SEO). Whatever you do, keep in mind that your profile is the main way a Flickr visitor has to find out who you are and what you have to offer. Part of your broad social media marketing strategy should be to have a presence on as many high traffic locations on the Internet as possible. Flickr provides an opportunity for further exposure if you have photos to share. View count and referrer statistics. Stats on Flickr are designed to give you insight into the ways that people are finding your photos. There are stats available for people surfing on Flickr itself – where the referrer is flickr.com – and stats about people coming from other websites. We can show you the sorts of things people search for on search engines where your photos turn up, and tell you how many views your photos have. Groups are the major medium for communication on Flickr. They represent people of like interests sharing their passions. Choose groups wisely and be willing to participate through sharing and commenting (remember comments brand you). Flickr facilitates easy participation in groups. Once you upload a photo you can specify what groups you want it to go to with an easy click. The more groups, the more exposure, but keep them relevant to your profile and purpose. When joining a group, make sure you take a note of their rules, e.g. limits on the number of photos you can add to a group in a day (e.g. 2 or 3). Flickr gives priority to photo titles when activating search results. However, people on Flickr will often find your images through your tags – so be industrious here. Check tags in use to see whether you can link to them. Descriptions are also important because they inform the viewer and give them a better context and understanding to view your images. You don’t want them to go away bewildered – they may not return. Providing an interesting description could hold their attention and stimulate their curiosity. Sets are groups of photos around a theme much like an album. This makes it easier for the viewer to look at related photos. If you have a Pro account, you can also create collections which are groups of sets. Both sets and collections have their own URL and a mosaic created from the photos that make up the set or collection. Collections are particularly useful where you have a large number of photos. Creativity and humor attract people to you (as evidenced by some of the top YouTube videos). A way to attract lots of traffic is to create an interesting and creative set of photos around a topical event. You will attract attention if you adopt an innovative perspective (in line with Seth Godin’s “Purple Cow”). So you make your photography available to others as long as they acknowledge the source. People can then use your photos on their websites and blog posts, in eBooks or in remixing to make other products. You thus place no restriction on commercial use of your photos as long as the attribution is given. This can have a viral effect as more and more people come to see your photography through a diverse range of outlets. You might be lucky and have one of the top bloggers like Brian Clark of Copyblogger pick up your Flickr photo and use it in one of his blog posts (he has 130,000+ subscribers). As with any social media site, it is important to maintain your momentum and contribute regularly through uploads, joining groups, commenting on others’ photos and using Flickr images in your content creation. As mentioned earlier, with a free account you can upload 2 videos each month (90 seconds max, 150MB per video). However, with a PRO account, you can upload an unlimited number of videos (still 90 seconds max) with a limit of 500MB per video. Flickr is a great way to leverage animated music videos created from photos via Animoto. In a previous post, I explained that with the free account at Animoto you can make an unlimited number of 30 second videos or with the All Access Pass, an unlimited number of videos of any length. Crop your photos : This is one way to achieve “fill your frame”. It is also important for quality presentation. Flickr uses thumbnail images for individual photos, sets and collections. It pays to be conscious of this and crop your shots so that you get the best result from your photography. It’s amazing how cropping can totally change an image and even convert a poor shot into a great one. Frame your subject: Find something in the scene to provide a natural frame for your shot. The image for this post is an example. 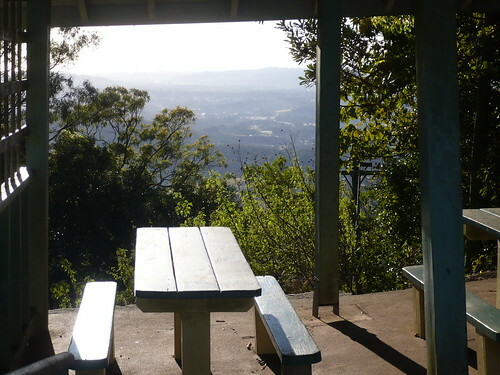 It is one of the photos that I took on holidays from a lookout in a mountain village, Montville, Queensland … the photo is aptly named, “Picnic on the Edge”. The 10 tips in this post offer ways to build your personal brand and Internet profile on Flickr and, like any form of small business marketing, demand consistent and persistent action.